Every month or so I work with our awesome Emerging Partner SA team to highlight the technical innovations we’re seeing from a range of APN Technology Partners. This month, we’re going to hear from Partner SAs Ian Scofield, Juan Villa, and Erin McGill, as well as Partner Development Rep Makda Tesfa-George, who discuss solutions from APN Technology Partners Cesanta, Fugue, Bright Wolf, and FittedCloud! Writing or porting real-time operating systems for different hardware platforms can be a complicated, lengthy, and error-prone process. Cesanta, an IoT software engineering company and AWS Advanced Technology Partner, develops and supports the popular Mongoose OS, an Open Source Operating System specifically designed for the Internet of Things. Mongoose OS currently supports the ESP32, ESP8266, STM32, and TI CC3200 microcontroller platforms. These are hardware platforms by Espressif, STMicroelectronics, and Texas Instruments, who are also APN Partners. With Mongoose OS you don’t have to set up a complex cross-compilation environment to build the OS for the target hardware platform. Mongoose OS provides a command line tool called “mos” that you can use to configure, build, and flash the OS for the target platform. Additionally, the OS has native support for the AWS IoT service, and you can configure it with the command line utility, which will automatically leverage the AWS IoT API to create a device and provision a certificate for use with the AWS IoT service. Mongoose OS has many features! I encourage you to check out their website for a detailed list. Need help engineering an IoT software solution using Mongoose OS? Cesanta provides licenses and engineering support to help you get started with your next IoT project. For additional information on using Mongoose OS with the AWS IoT service I encourage you to check out this blog post by a fellow AWS Solutions Architect. Our APN Technology Partner Fugue continues to expand their offering in the DevOps space on AWS, for SMEs and larger enterprises. Fugue previously made an appearance on this blog because they help AWS customers to validate, build, and enforce cloud infrastructure with an automated, easy-to-integrate system. Fugue has released its new Team Conductor to enable customers to centralize the management of multiple workloads across a number of AWS accounts. The Fugue Conductor runs inside a customer’s AWS account and automates the full lifecycle of cloud infrastructure environments. Using cross-account IAM roles, the Team Conductor only needs to be able to assume the role in the external account so no credential secrets are shared. There’s no need to deploy a Fugue Conductor in every account in which customers want to manage infrastructure. This provides a simplified and more cost-effective solution for managing workloads. Fugue’s Team Conductor provides role-based access controls (RBAC) to facilitate secure collaboration around AWS infrastructure operations. Customers can create Fugue Conductor users to interact with AWS infrastructure via Fugue and regulate the creation and modification of cloud resources. Fugue has also released a prototype tool designed to help you visualize AWS infrastructure. As customers expand their AWS workloads, the interactions among all the services can become more complex. With Fugue’s prototype visualization tool, customers can view how their environments are designed and how services interact with one another. Fugue’s visualization tool is presented in three panes. The left pane column shows your file structure with sample Fugue compositions that will create your AWS infrastructure. The middle pane displays the composition that is being visualized, and the right pane provides the illustration. Customers can view their AWS infrastructure before creating or changing any resources. 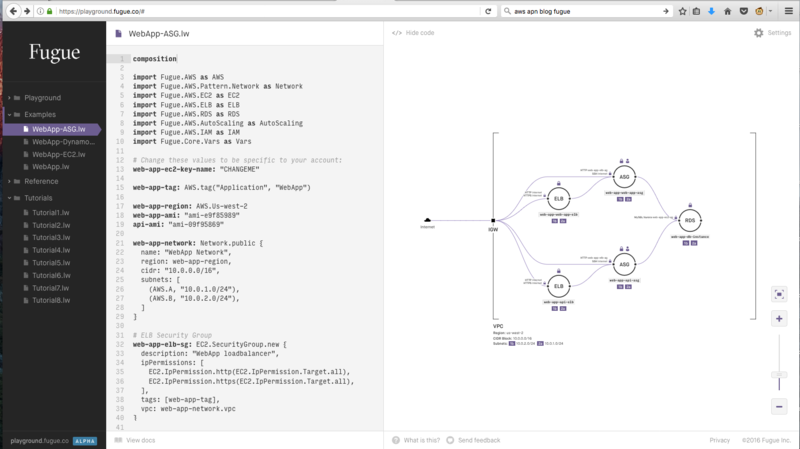 Head over to https://fugue.co/ and sign up to launch a Fugue Conductor AMI in your account to start working with Fugue, and head over to https://playground.fugue.co/# to learn more about Fugue’s visualization tool. Enterprises are excited to take advantage of the AWS IoT Button Enterprise Program. 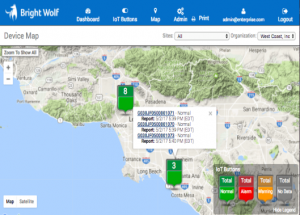 Bright Wolf, an APN Advanced Technology and IoT Competency Partner, has released ZipLine, an instant-on visual platform for rapid deployment and configuration of multi-tenant AWS IoT Enterprise Button solutions. ZipLine is built on Bright Wolf’s Strandz IoT data management platform and uses AWS IoT, AWS Lambda, Amazon SNS, Amazon SQS, Amazon RDS, AWS Elastic Beanstalk, Amazon S3, and other AWS Cloud services. ZipLine runs as an Amazon Machine Image (AMI) inside the enterprise customer’s account. ZipLine makes fully contextualized button events readily available for integrated enterprise systems, using SQS to connect with existing business workflows and AWS infrastructure, which enables highly customizable solutions for AWS customers. ZipLine’s out-of-the-box, ‘no code required’ user interface for assigning and managing large fleets of buttons makes it easy to quickly deploy across different organizations and sites. Flexible event types, notification settings, and role-based access control (RBAC) enable AWS Enterprise IoT Button customers to rapidly configure and deploy multi-tenant button-based solutions. ZipLine’s built-in dashboards and reporting include a clickable map view with customizable interior floor plan maps, historical and real-time activity monitors, and remaining useful life indicators for each button, and provide a fast track to Amazon Machine Learning and other business intelligence offerings. For more information about Bright Wolf and ZipLine, check out the company’s website. Some of the many benefits of using AWS are agility and elasticity, being able to provision new resources when you need them, and the ability to scale to meet your needs. However, optimization is still important to ensure that you don’t under-utilize or waste resources. Examples may include provisioning large Amazon Elastic Block Store (EBS) volumes, but only using a small fraction of the total capacity. Or maybe you originally selected an m4.10xlarge instance for running your application, but it really only needs to an m4.2xlarge. These are just two examples of areas where customers can achieve significant cost savings. APN Advanced Technology Partner FittedCloud can help you examine your resources and make intelligent recommendations to identify these areas for optimization and alert customers using ‘Actionable Advisories’. More importantly, it can take automated actions on your behalf with zero or minimal impact to your applications. ‘Actionable Advisories’ support a broader set of AWS resources and allow users to click on alerts to take immediate cost saving actions. Complete automation of optimization actions driven by user defined policies or machine learning is supported for Amazon EC2, EBS, and Amazon DynamoDB. FittedCloud’s AWS EBS Optimizer, through the use of an agent, manages your EBS storage to help ensure you only pay for the capacity you actually use. It employs machine learning algorithms to help predict usage patterns in order to closely match the amount and type of resources with your utilization. It supports all EBS volume types, including GP2, Magnetic, SC1, ST1, and IO1. FittedCloud takes the newly released Amazon EBS Elastic Volumes and adds on features, such as the ability to decrease a volume size without user interaction. For both Amazon DynamoDB and Amazon EC2, FittedCloud gives users the option to define specific scaling policies, or you can employ the same machine learning algorithm to make metric-driven automated actions. FittedCloud can also provide Instance Rightsizing by analyzing usage to determine the optimal instance size. Additionally, it can identify rogue or abandoned instances which can not only reduce unnecessary costs, but help mitigate security risks as well. All of these recommendations and a breakdown by resource can be seen on their dashboard, helping you see where your significant cost savings are. To learn more about FittedCloud and their offering, head on over to their website or check out their blog!